This past summer, union fat cats were banned from dipping their hands into public sector employees' paychecks as the Supreme Court ruled in Janus v. AFSCME that forced union fees are a violation of the first amendment and a form of compelled political speech. So in order to skirt these rules, unions across the nation have established bogus, and arguably illegal, 'window periods' or designated times which public sector employees must declare that they do not give permission for their respective monopoly bargaining unit to take their money. These periods typically last a week and have no real reasoning other than because the union said so. Now, a lawsuit in Oregon takes these schemes to task and asks a federal court to declare these arbitrary rules unconstitutional. As reported by Bill McMorris of the Washington Free Beacon, the National Right to Work Legal Defense Foundation is providing free legal aid to a group of Oregon public employees "that Service Employees International Union Local 503 and AFSCME Council 75 have created artificial barriers for workers by giving them limited time windows at which to submit their resignations." The suit, presented by attorneys paid for by the nation's number one employees' rights group, asserts that the "Defendants' actions and dues deduction revocation restrictions violate the employees' exercise of their First Amendment right not to pay moneys to a union without their affirmative consent and knowing waiver of First Amendment rights." When employees tried to SEIU officials that they could not take their money, they received a letter stating that "We are in receipt of your letter requesting to resign your membership with SEIU Local 503. "Dues deductions cannot be terminated except in the periods set forth in the authorization … At that point, the Union will take appropriate steps to have your dues checkoff canceled." "Union officials have a long history of manipulating ‘window period' schemes, arbitrary union-enacted limitations trapping workers into forced dues, and other obstacles designed to block individuals from exercising their constitutional rights," National Right to Work Foundation president Mark Mix said in a statement. 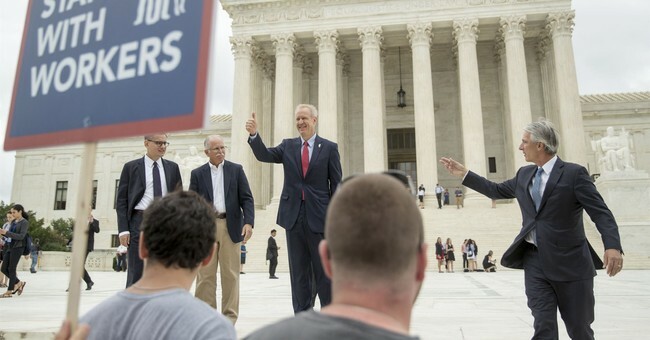 "The Foundation's victory in Janus at the Supreme Court provided much-needed protection, but as this case shows union bosses are now defying the Supreme Court to continue their abusive practices." According to McMorris of the Free Beacon, "The suit asks the U.S. District Court in Portland to overturn the withdrawal limitations and restore the dues and fees workers in the class have been forced to pay."